Film bloggers tend to be very social, at least among ourselves. We like to discuss various topics related to film and exchange ideas. This is particularly true of those of us whose focus is on older films. Unfortunately, it is sometimes the case that we find those associations for film bloggers tend to be a poor fit for us. Sadly, it seems sometimes classic film blogs tend to get lost in the mix of various other film blogs. This is the reason for the formation of the Vintage Association of Motion Picture Blogs or VAMP for short. VAMP is an association for bloggers who write primarily about films made before 1980. The word "vintage" is used instead of the word "classic" for the simple fact that not every old movie is necessarily a classic, the word classic implying a level of greatness that not every film will possess. Nineteen eighty is simply an arbitrary cutoff point with the understanding that a film must be of some age to be considered "vintage." Many film bloggers might set the cutoff point for vintage films much earlier. 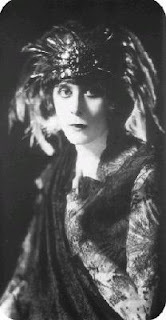 Given our abbreviation, silent actress Theda Bara, the vamp herself, is our mascot. If you wish to join VAMP, send an email to thevampb at gmail.com or a direct message on Twitter at VAMPblogs. The blog looks sensational, Terry. Thanks for having me aboard, and linkage to the new blog at TDoY is up. Very exciting - I would love to join! My blog is "A Person in the Dark" at www.flickchick1953.blogspot.com. FlickChick, I've gotten you added! Please add my blog site, "Carole & Co." (http://carole-and-co.livejournal.com). VP91955, I've gotten you added! Kristina, I've gotten you added! VP81955, thank you for the mention in the blog post! You did it! I was hoping you would start it after that Twitter conversation. I've gotten you added, Jill! Hi! I sent an email yesterday, asking to join, but no response. Do you have room for one more? I'd love to join also if I could, Im about anything pre-60s from art to politics, but primarily focus on film. Thanks! WELL! I didn't know if my membership had been accepted or however that works. Am thrilled that I am. Just saw my blog on your list. WOOT! Am adding the Vamp graphic to my home page. So nice - and THANK YOU! Margaret and Jo, I've gotten you added! thanks! my blog has a new address, actually http://thelastdrivein.com/ I'm putting up the VAMPB graphic now!